Ayodhya is a symbol of our 'aan, baan aur shaan' (honour, pride and prestige), says UP chief minister Yogi Adityanath. UP Chief Minister Yogi Adityanath is on a spree to change names of districts in his state. After renaming Allahabad as Prayagraj, the name of Faizabad district has been changed to Ayodhya. On the occasion of the Diwali eve on Tuesday, Adityanath said that the Faizabad district will henceforth be known as Ayodhya. "Ayodhya is a symbol of our 'aan, baan aur shaan' (honour, pride and prestige)" he said at the pilgrim town, which is 120km from the state capital Lucknow. "Nobody can do injustice to Ayodhya," he said, adding that the holy city is identified by Lord Ram. He also announced the setting up of a medical college in the name of King Dashrath, father of Lord Ram, in the district. "A medical college will be established here in Ayodhya, I want it to be named after King Dasharatha. We will also construct an airport here named after Lord Ram," said the UP CM. Later in the evening, South Korean First Lady Kim-Jung Sook, who is on a four-day visit to India, and Yogi Adityanath performed 'Aarti' on banks of Sarayu river in Ayodhya. As per news agency ANI, over 3,01,152 earthen lamps were lighted at the event named as Ayodhya Deepostav 2018. The event entered the Guinness Book of Record for lighting these lamps. 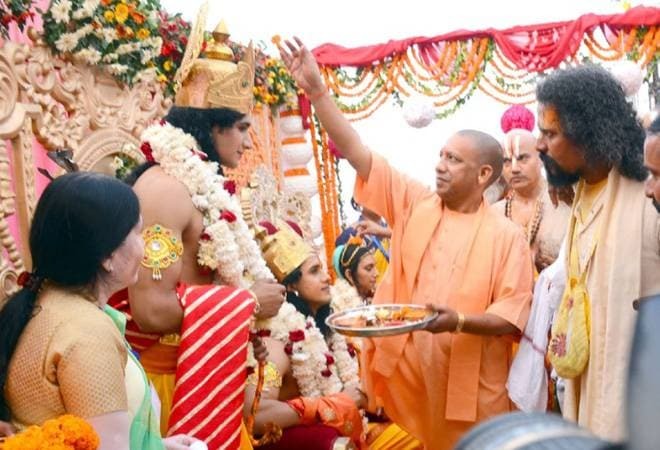 On October 16, Yogi Adityanath had announced to rename the historic city of Allahabad to Prayagraj, ahead of the 2019 Kumbh Mela. The move had drawn flak from the Opposition parties, including Congress and the Samajwadi Party. Akhilesh Yadav, former CM of Uttar Pradesh blasted Yogi, saying he wanted to show that he is working just by changing names of places. "They have even re-named Ardh Kumbh to Kumbh. This is toying with tradition and belief," he said.